Vacuum is an international rapid publications journal with a focus on short communication. All papers are peer-reviewed, with the review process for short communication geared towards very fast turnaround times. The journal also published full research papers, thematic issues and selected papers from leading conferences. A report in Vacuum should represent a major advance in an area that involves a controlled environment at pressures of one atmosphere or below. 1. 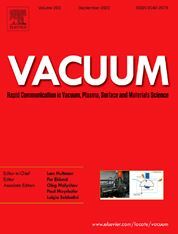 Vacuum; original developments in vacuum pumping and instrumentation, vacuum measurement, vacuum gas dynamics, gas-surface interactions, surface treatment for UHV applications and low outgassing, vacuum melting, sintering, and vacuum metrology. Technology and solutions for large-scale facilities (e.g., particle accelerators and fusion devices). New instrumentation ( e.g., detectors and electron microscopes). 2. Plasma science; advances in PVD, CVD, plasma-assisted CVD, ion sources, deposition processes and analysis. 3. Surface science; surface engineering, surface chemistry, surface analysis, crystal growth, ion-surface interactions and etching, nanometer-scale processing, surface modification. 4. Materials science; novel functional or structural materials. Metals, ceramics, and polymers. Experiments, simulations, and modelling for understanding structure-property relationships. Thin films and coatings. Nanostructures and ion implantation. The aim of the short communications is to enable researchers to rapidly share their most exciting work with their colleagues. The expected time from submission to final decision is approximately 6.4 weeks.